Sport your finest tweedy attire and join BFOC for a leisurely jaunt about town on bicycle! The legendary Tweed Ride will roll out of the Union Station at high noon, 12:00pm on December 3rd! Traffic will naturally pause, watching in disbelief as happy cyclists pass by pedaling through the crisp winter air. The entire group will be wearing charming tweed outfits, like a collective art installation transporting everyone involved to a more beautiful time and place. The pace is slow enough for anyone to keep up, so dust off your cruiser, let your street bike enjoy the relaxing pace, invite your sweet old neighbor and bring the kids. The bike ride route will be from Union Station to Local Hub Bicycle Shop where one lucky cyclist wearing the best Tweed outfit will be awarded a gift card. Then we will move onward to Internet Cafe 2, and finally to Turner House in North Oak Cliff. Oddfellows Restaurant will sponsor the activities on the lawn including tug-of-war, 3-legged races, and more! Matt Tolentino of the Singapore Slingers will be back performing accordion on the lawn, and there’ll be plenty of hot cider and mulled wine. The Facebook event is here. This is your chance to get friends and family on bicycles together for a day full of smiles, whether they normally ride or not! Don’t own a bike? There are plenty of bike shares out there! And our starting location, Union Station, is SUPER easy to get to via public transportation, so consider planning your day to include an adventure on the DART train, local busses, or organize a group ride from your neighborhood to the starting point then home again. There will be plenty of Bike Share bicycles available too. Be on the look out for the a free ride Promo Code! There is no cost to join the ride! Bring your own picnic, pack extra to share with new friends and bring cash to buy refreshment or BFOC swag. There will be pint glasses, cycle-related booklets, and t-shirts available. 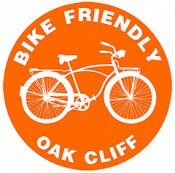 Proceeds from all sales will support the community efforts of Bike Friendly Oak Cliff. For a taste of what is in store and for apparel ideas, view the galleries of the original New York Tweed Ride, and San Francisco Tweed Ride.